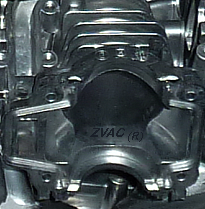 ZVAC is the name given to a simple, rugged, reliable and effective hyper super vacuum die-casting technique for preventing casting porosity. ZVAC has strong functional performance, excellent reliability and easy maintenance, which bring substantial quality improvements to diecasting atributes. The latest technique enables dies to use deep vacuum, by using large standard pipe mounted vacuum valves, powerful dry running pumps and extra-large receivers. The pumps having perfomance characteristics of being able to attain ultimate pressure less than 0.6kPa, and during production, a volumetric pumping rate capable of maintaining an average system pressure below than 2kP with high water vapour handling. The method was developed to enable zinc alloy diecast parts to be powder coated and stove baked-cured at 200°C (392°F) for 20 minutes, without out-gassing, blisters or cissing; and that requirement was exceeded on its very first run, using a 30+ years old Bühler 400D hot chamber diecasting machine. Designed in November 1990 and commissioned early January 1991, ZVAC went global in 2001 and named 'ZVAC®'in 2004. ZVAC now makes strong, beautiful, aluminium, zinc and magnesium die castings in many small and large foundries worldwide.